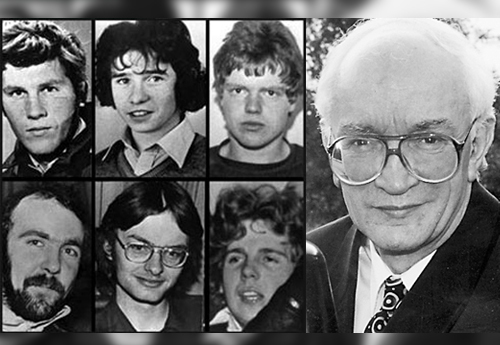 Northern Ireland’s most senior coroner has launched an unprecedented attack on the failure of the British government and Department of Justice to properly resource investigations into the killing of nine men in Co Armagh 30 years ago. The Detail has obtained a copy of a letter from Senior Coroner John Leckey’s office to Justice Minister David Ford which claims that inquests into the IRA killing of three policemen and subsequent RUC shooting of six men in Co Armagh in 1982 is being “funded on a drip feed basis” with “no demonstrable commitment” to ensure that they are properly resourced. While the coroner’s criticism in this instance specifically relates to the so-called ‘Shoot to Kill’ inquests, the issues raised in the letter are understood to impact on a wide range of other controversial Troubles related killings. •	It should be viewed as an “enormous source of embarrassment to the state that these inquests have not been held”. •	The PSNI’s attitude to disclosing sensitive material to inquests is “driving up costs”. •	The senior coroner is “deeply frustrated” that, despite making a request three years ago, his office has yet to be provided with its own expert investigator to assist with cases. •	Mr Leckey warns that if the European Court of Human Rights imposes sanctions for continued delays in holding inquests he will not allow the coroner’s office to be blamed. Justice Minister David Ford defended the resources allocated to the ‘Shoot to Kill’ inquests stating that his department is committed to meeting its obligations to properly resource inquests in an “efficient and cost effective” way. There have been repeated delays into the holding of inquests into the IRA killing of three policemen and subsequent RUC shooting of six men in Co Armagh in 1982. RUC men Sean Quinn, Alan McCloy and Paul Hamilton were killed by an IRA landmine near Lurgan in October 1982. Within weeks Gervaise McKerr, Sean Burns, Eugene Toman, Seamus Grew, Roddy Carroll and 17 year-old Michael Tighe were shot dead by the RUC’s Special Support Unit (SSU) in a series of controversial shootings in Co Armagh during a three week period. All but Michael Tighe were members of republican paramilitary organisations; however none were armed at the time they were shot. A key part of evidence in the ‘Shoot to Kill’ inquests relate to a report by then Greater Manchester Deputy Chief Constable John Stalker, who was called in to investigate the killings in 1984. Mr Stalker’s report has never been made public after he was dramatically removed from the investigation in June 1986, shortly before it was due to be published. The senior coroner had hoped to open inquests into the so-called ‘Shoot To Kill’ deaths in April 2013, but protracted delays in the PSNI disclosing sensitive materials has led to the full proceedings being delayed indefinitely. The families of those involved have claimed that the continued delays are aimed at frustrating public hearings into the shootings. But the PSNI and Security Services insist that there are issues of national security contained in the documents which have to be properly scrutinised to ensure that sensitive intelligence is not improperly placed in the public domain. In what is being seen as the most severe criticism of the continued delays into the ‘Shoot to Kill’ inquests, the Senior Coroner’s Office wrote to Justice Minister on May 06 stating that Mr Leckey had “done his best to cajole and persuade” the PSNI and Court Service to provide adequate funding, personnel and practical arrangements for hearings. The letter, written by the Coroner’s Office solicitor highlights a “not inconsiderable amount of frustration on the part of the Senior Coroner”. “The families of the deceased and the witnesses age, and many have already died without these inquests having been heard. The delay for the families of the deceased and for many of the witnesses involved must be nothing short of intolerable. The letter states that the lack of resources afforded to the inquests was “wholly unsatisfactory” and is preventing the Coroner’s Office from properly planning the logistics needed to hold hearings. The senior coroner expressed concern over the financial costs which are being accrued as a result of the PSNI’s inability to meet agreed deadlines for the disclosure of sensitive material to the court. In 2011 Mr Leckey had requested funding for the use of an expert investigator to independently assist the Coroner’s Office during the inquest hearings. However three years on the letter states that Mr Leckey “remains deeply frustrated” by the absence of an appointed Investigator. “It is essential that this role is filled as early as possible… there is no scope for any argument over budgetary constraints. “The Senior Coroner has been actively seeking the appointment of an Investigator for going on three years … This Office has indicated the need for such an appointment for several years now and resources should have been in place to allow me to move directly to this appointment at the point it was required. In recent years the Department of Justice and Northern Ireland Office has publicly expressed concerns over the financial cost of investigating the past and the need to monitor budgets. However the Senior Coroner has warned DoJ and the NIO that concerns over the financing of inquests cannot be allowed to delay judicial hearings into the deaths. And Mr Leckey warns that he will not allow his office to be blamed if the government faces further sanctions and criticisms from the European Court of Human Rights as a result of continued delays. “You have raised budgetary issues and value for money issues and it is appreciated that money is not plentiful currently. …. It is not a task that can be avoided because there is no or insufficient money. Nor can judicial directions in terms of ensuring compliance with this obligation be deemed subject to a business case to the point of becoming lost in a mess of bureaucratic wrangling. Money has to be prioritised to the completion of these inquests. Otherwise, the further sanction of the European Court of Human Rights awaits. Read Senior Coroner’s letter to Justice Minister David Ford here.